What is a warehouse management system for? To answer this, it is necessary that we know what a warehouse is for and what part of the business process it plays. A warehouse is a physical structure under which roof are stored a company’s finished products before they are shipped to the end-user, the customer. It is a vital part of the entire process of goods production. 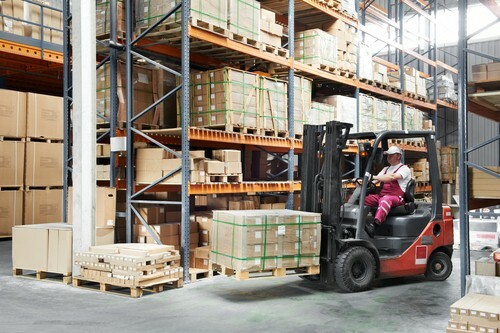 A good warehouse system at the onset addresses the following issues — health and safety, human resources management, security, pest control, warehouse maintenance and cleaning, quality control, record keeping and reporting, reverse logistics or the return of goods and exit strategy in the event of downscaling or shutting down operations, and disposal of obsolete and damaged goods. An ideal warehouse system is one which receives finished goods just as soon as they are produced, and which houses those finished goods for a just-right period of time before they are delivered to the customer. Warehouse system is critical to businesses producing perishable materials. Items must get to the customers at their peak. Seamless is a word that would best describe a good warehousing system. Since there are costs associated with prolonged storage — for example, spoilage or diminished quality — as well as delayed delivery, the objective is to receive the goods, store them, and ship them off at the lowest cost possible. Aside from the costs, customers will also be kept satisfied as they receive their orders at precisely the date agreed upon, with the products in top condition as expected. Only a good warehousing system will guarantee these results. To do this, practically every batch of product that comes in has to be logged and watched closely. And since such effort is not humanly possible, this is where the benefits of a warehouse management system come into play. A warehouse management system or WMS as it is also known, tracks and monitors the progress of products through the warehouse, from the time they are received to the time they are moved out for shipping. It involves the physical infrastructure (the warehouse itself), the tracking systems, and the communication and data sharing between product stations. There are also multiple levels of warehouses. There may be a central warehouse, a regional warehouse and retail warehouse. in each of these, a warehouse inventory system has to be in place so that every single product, or batch of products, arrives, stays and leaves for just the right amount of time. Having established the advantages and the benefits of a warehouse management system, we go now to the functionality of such systems. First, there is a standard receiving process that handles a shipment when it arrives. This can be individualized to each warehouse or product type. Then, there is the receipt of stock and returns into a warehouse facility. There are costs to storing unnecessary parts and products; hence, there is a optimum amount of product that should be in storage at any given time. The logical representation of the physical storage facility is also important. For example, some products may be sold more often than other types. These can be grouped together or moved near the entrance to speed up picking, packing, ad shipping to customers. There must be a link to order processing and logistics management. Finally, there must be something which tracks where products are stocked, or which suppliers they come from, or for how long they are stored. Warehouse management alone cannot achieve automation. It must be used in combination with business processes for best results. Sometimes, a warehouse management system is a stand-alone system. In other times, it is but a module in an enterprise resource planning system ir a supply chain execution suite. The warehouse management system will really all depend on the size and sophistication or complexity of the organization. In its most simple, it is like a handwritten list that is updated periodically, or as soon as new products are received or shipped out. Sometimes, simple spreadsheets using Microsoft Excel or Access are enough; sometimes, purpose-built software programs are best. Indeed, technology has done much to enable managers to more effectively track the flow of goods in and out of the warehouse. A warehouse inventory system has immediate and very visible results. Those warehouse managers and business decision makers who were quick to decide on adopting a warehouse inventory system observed improvements in their business than those who were hesitant to modernize. Inventory is ot just a bunch of your products sitting in one corner of your warehouse. It is key to performance, efficiency and customer satisfaction. Indeed it is not good for the business of all the goods are at the back of the store and the shelves are empty. Nobody would know that the products are there. Similarly, it is also not good if everything is on the shelves and nothing is stocked anymore. Another bad warehouse practice is having an inadequate amount of products such that client’s expectations are not met. On the other hand, having too much stock also causes a problems as they take up space and the products may lose their optimum quality. Optimization is the operative word, be it in picking, packing, shipping. A warehouse system software also integrates information from front-of-house inventory and sales (what’s sitting on the shelves) to back-of-house inventory and sales (warehouses, in stock that are shipped directly to customers). One will tell the other when that it is time to replenish — or not yet. Finally, a good warehouse management system must be user friendly in that the employees handling it would be able to be familiar with the system in no time. Businesses have everything to gain from having in place a warehouse management system, in a level of sophistication proportionate to the needs of the company.